I love strong (expensive) coffee with a full body and great taste. My boss didn’t like this coffee, it was too “earthy” for him, so he gave it to me to try out. I loved it! I always pay a little more for coffee and find it is worth it. This coffee is local to Milwaukee, so I also like buying local products when I can. 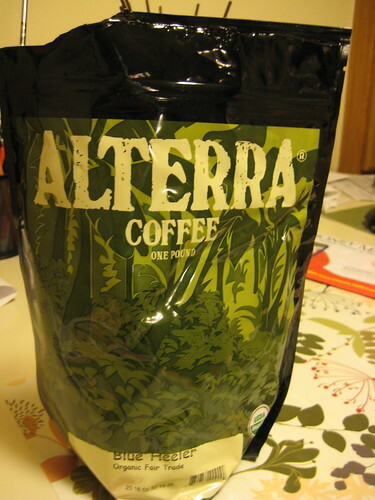 I don’t buy Alterra too often, but maybe I will more now that I was so impressed with my yummy cup this morning. Breakfast was boring cereal today–Honey Nut Cheerios and coffee. I wish I could eat more for breakfast, but I just feel so full after my coffee! I know I need to eat more protein in the morning though because I get hungry at about 9:30 or 10 a.m. every morning. At work, I snacked on Cranberry Walnut bread and had another cup of coffee. Lunch was about 90% organic. The only thing that wasn’t organic was my string cheese. I had tried Stonyfield’s Soy Yogurt last month and didn’t love it. The flavor I had was Blueberry. Today, I tried Raspberry and it wasn’t so bad. The flavor was still not as good as dairy yogurt. I am going to try Whole Soy yogurt soon and see if I like that better. Every time I make one of those Amy’s vegetable pot pie meals, my co-workers comment about how good it smells when it’s warming up in the microwave. It is pretty good. I don’t eat frozen meals anymore except for Amy’s. The other organic item was my chocolate for dessert! 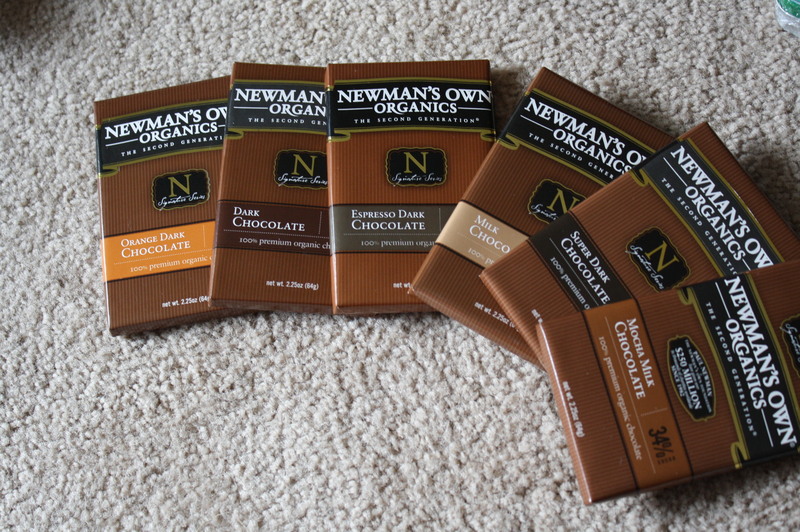 I tried Newman’s Own Organics Espresso Dark Chocolate. This flavor is perfect for a coffee lover like me. I have had other espresso chocolates that were more strong in flavor but I liked the subtle flavor of this one. Dinner was my usual quick meal. A whole wheat tortilla with cheese and pintos. What is with me and this meal? I really need that oven to work so I can make some recipes from cookbooks and be a little more creative. We really did have to rush to eat because I ran to Target after work and then we met my in-laws and Craig’s Aunt at the YMCA for the community free week. My in-laws have never belonged to a gym, so I showed them around and then they tested out some machines. I hope that they join a gym someday. Maybe when they are both retired and have insurance that offers a membership for free. My parents have that and it really encourages them to go more often with free classes for senior citizens, which is great for them both socially and physically. Before my mom started working out, she was getting arthritis in her arm and could not lift her head over her shoulder (and even secure her bra). Joining a gym helped tremendously and her doctor credited her lack of pain and increased mobility in that arm with her exercise regimen. I need to get to bed early tonight. My body is sore from Sunday’s Body Pump and yesterday’s Boot Camp. It isn’t sore in any particular area, just is overall and I feel tired. Resting in bed is going to feel so good!